UPDATE Sept 2014: At the time this review was written (two years ago), Yoyo Chinese was still starting out. One of the early gripes were a lack of Intermediate content. I’ve not explored this content yet, but will probably do so soon. It’s great to see them still going & update it with more content (longevity FTW!). I preserve the original review below as it was a representation of my opinion on the service at that time. Be sure to keep in mind that things do have changed since then. Enjoy! A short while ago, Yangyang contacted me with the opportunity to review Yoyo Chinese. I first got to know of Yoyo Chinese through Albert’s blog post (from LaowaiChinese) who is working there now. Fresh in my mind I was curious to check it out. 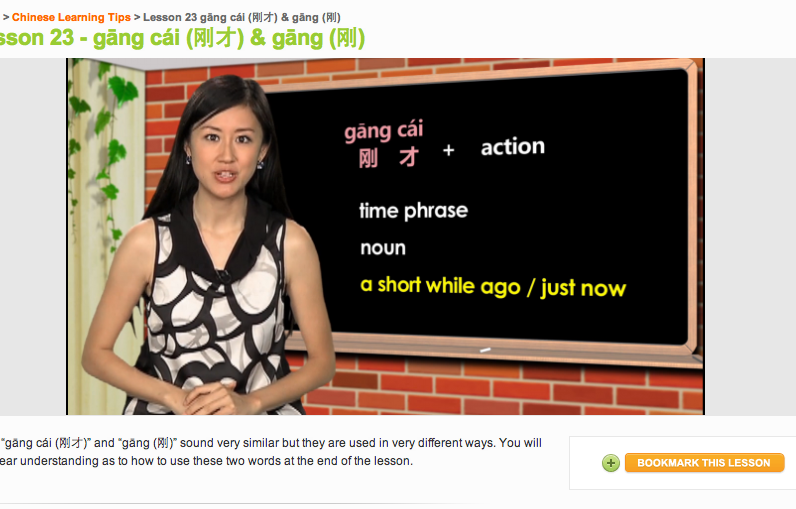 Yoyo Chinese offers short video courses on learning Chinese as well as audio lessons, however the video content outweighs the amount of audio content. They are priced at various levels on a subscription basis. The month-to-month option is $15.95. You can also request tutoring at additional charges. Now for an intermediate learner like myself the content was a bit disappointing. I did however find the Chinese grammar and Chinese learning tips sections interesting. They ask quite interesting questions and portray the content very concisely. I like that. This is what sets online content apart from classroom content, in that I often find that it is explained more efficiently and effectively. Yangyang herself is a good host. She speaks clearly and concisely. I quite like the blackboard in the background idea as well. Makes for a good visual + audio combination. In the end, Yoyo Chinese is just starting out. At the moment there are definitely some interesting content for an intermediate learner, but advanced learners should look elsewhere. For beginners, this is an excellent website. In fact, I would recommend it for anyone curious to start learning Chinese. The grammar lessons are concise and well explained. I have to add that Yoyo Chinese is not a holistic solution. You will have to supplement your studies with other (conversational) input, as Yoyo Chinese mostly focuses on grammar instruction and this is where they excel. I'll keep my eye out to see if Yoyo Chinese starts developing intermediate/advanced content and how they approach it. + Well organized website and content. - Mainly focuses on grammar. Will need other input too. Update: Yoyo Chinese have contacted me stating they will provide intermediate content in the near future. Hopefully it delivers in the same way they deliver excellent beginner and Chinese grammar content.